It’s no secret that my husband is car crazy! 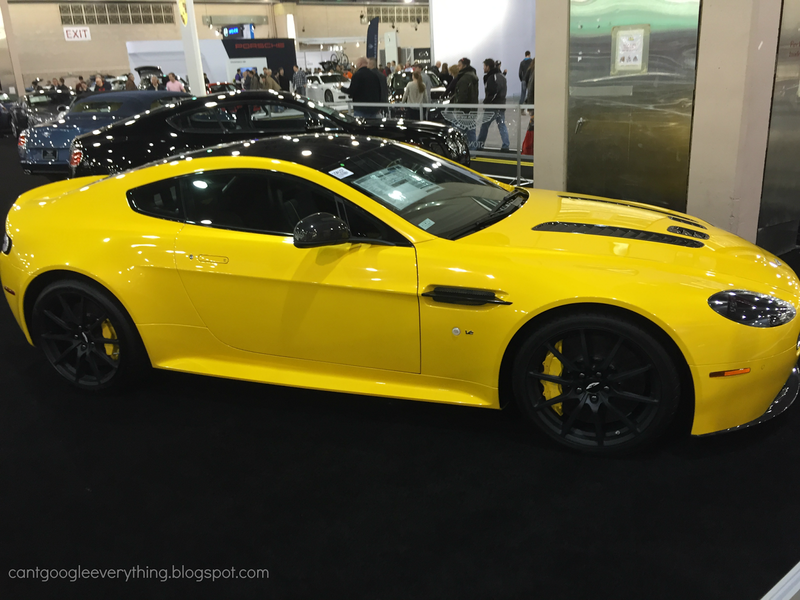 We go to as many car shows as possible and this weekend we headed to the Philly Auto Show at the convention center in Philadelphia! The car show has something for everyone and we all had a good time! My son loved sitting in all the cars and pretending to drive. 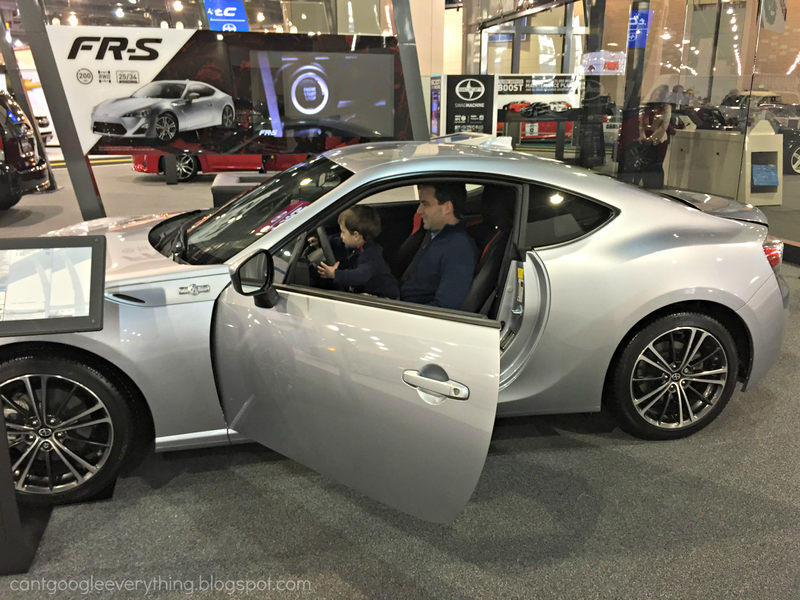 Our first stop was Scion where my husband and son sat in the new FR-S. We let Carter walk around a lot of the time instead of making him sit in the stroller and he loved it! At the gate they gave us a wristband to write our name and phone number on just in case he got lost, which we thought was a great idea. Next we booked it over to Jeep because I wanted to do the Jeep driving experience. We decided not to wait in the super long line- seriously everyone must have gone there strait away! Instead we let Carter do the kids driving experience. 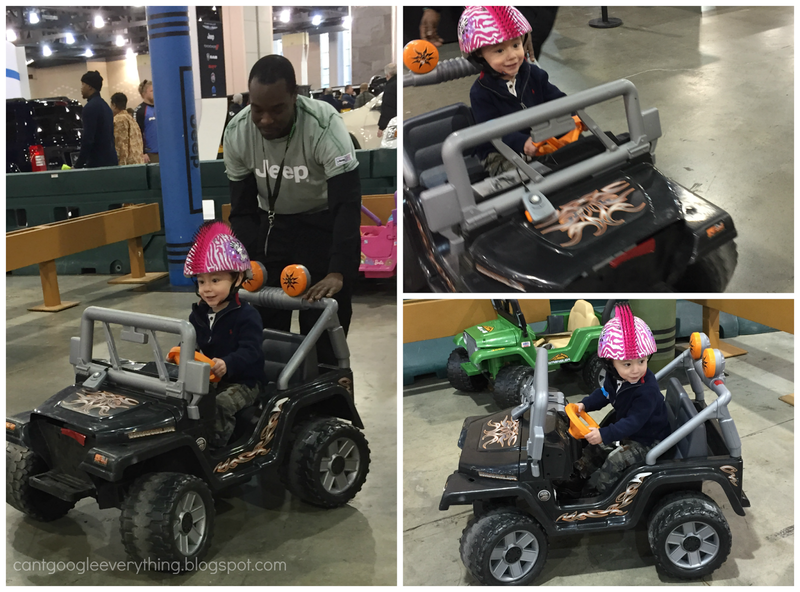 They had kid Jeeps to drive, and although he needed a little help with the turning and steering, he had a blast! They let him choose his own helmet and he picked out pink! They also had a rock climbing wall for kids to try out. 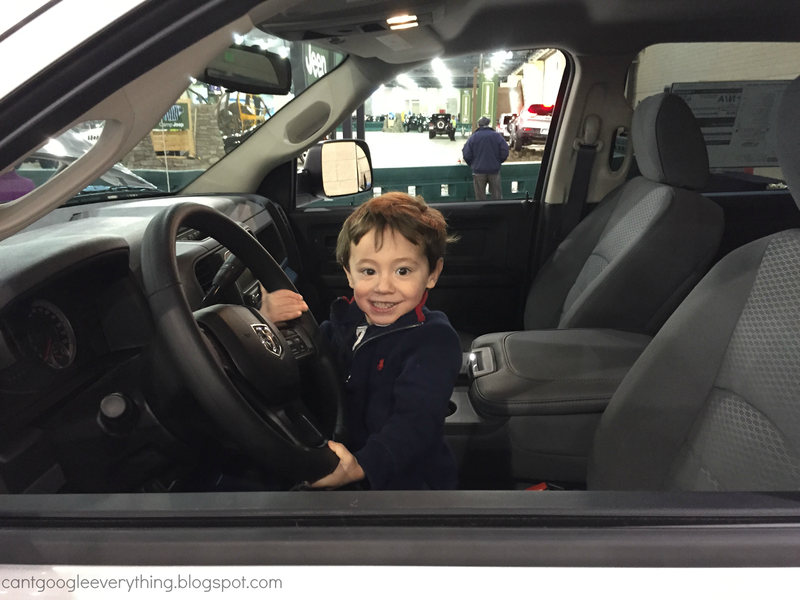 Carter really wanted to drive the big “truck trucks” so we helped him climb on up in the Dodge Ram. It was so big he barely cleared the tires, but he loved it! Of course they have a huge section of “exotic” cars at the auto show, including this beautiful Aston Martin. You weren’t allowed to sit in these, though. One of my favorites to sit in was the Audi Q3 SUV, although to be honest the back seat was a bit small for my taste. I can only imagine the seat kicking that would be going on from my son’s car seat into the back of the front passenger seat! The Porshe Cayenne they had on display did seem to have more legroom. But my favorite SUV we saw was the Lexus GX, which had plenty of room and even a third row of seats that you could fold up or down. After the main show room we headed to the smaller show room with Mercedes, Smart and Lexus. 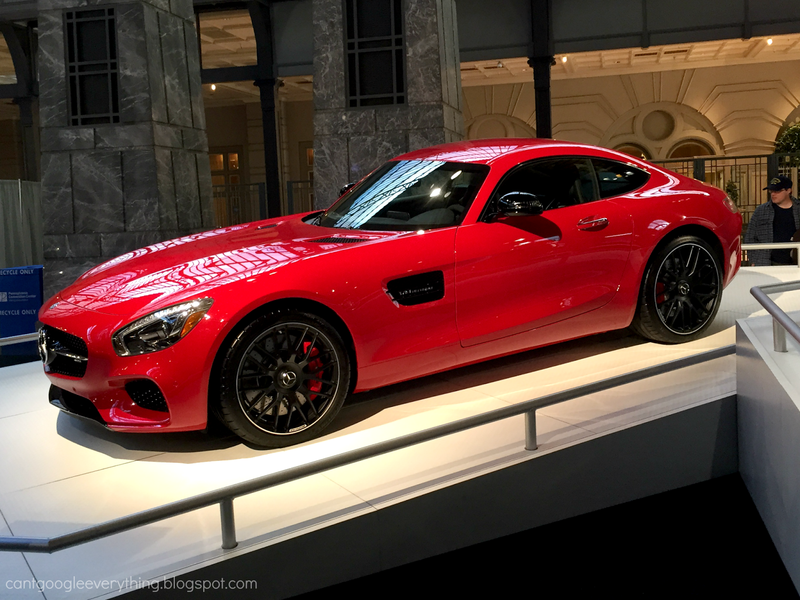 You might recognize this Mercedes AMG GT S from the Superbowl commercial with the turtle/hare race. It was hard to get a photo without a bunch of guys stepping in front of me to get a closer look! Last, we headed downstairs to the DUB show room, which showcased all kinds of cars in any sort of customization you could imagine! We saw everything from a DUB Toyota Corolla to a Nissan Skyline. They also had custom bikes and showcases for sound systems, paint and all kinds of customizations for your car. The Philly Auto Show is open through February 8th at the Pennsylvania Convention Center in Center City. You can visit their website for hours and all the information. I recommend going as early as possible before the crowds- buy your tickets online so you can go right in! And, if you want to do the Jeep Driving Experience or the Ford interactive (think video game) experience go there first, because the lines build up fast. They also had outdoor “ride and drive” experiences for Toyota and Kia, but as it was about 5 degrees when we went on Saturday we skipped those. 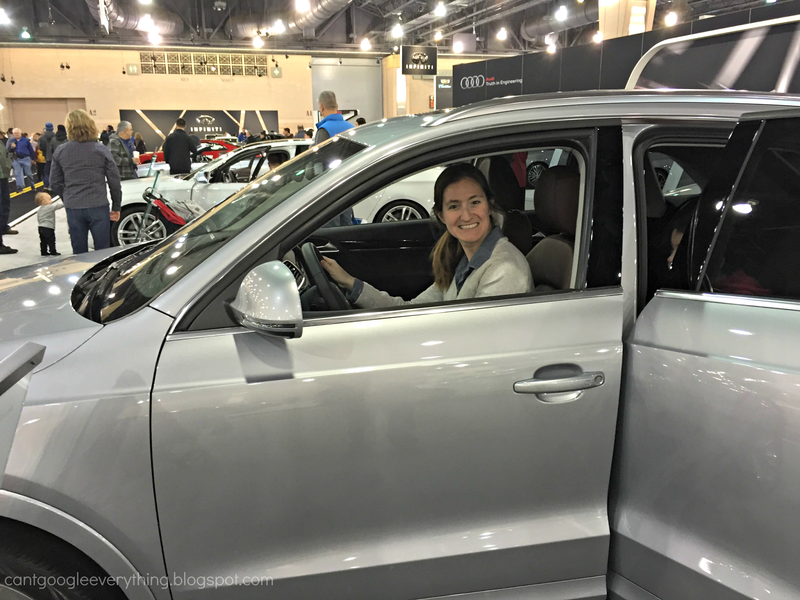 Disclosure: I received free tickets to the Philly Auto Show. All opinions and photos are my own. I didnt even know it was NOW until I saw the posts litter my IG feed!!! Looks like it was a good time. Dave just went yesterday and had a blast! Sadly I couldn't get off work or school so I had to miss out, but he did get to check out the Jeep experience and loved it! Thank you again for the tickets! 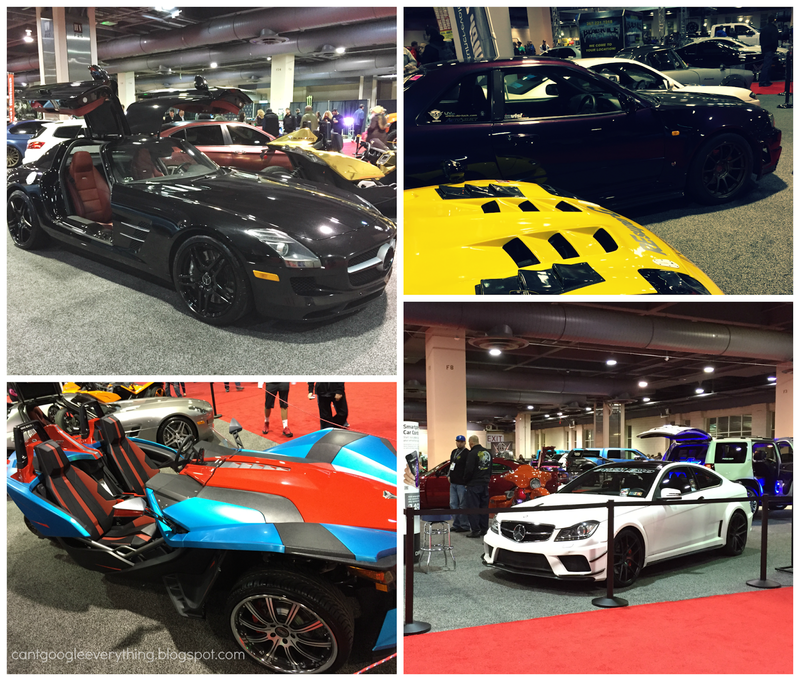 Looks like you had a blast at the Philly Car Show!! This is the first year in I don't know how many years that the husband and I are going to be unable to go. Car shows aren't my favorite, but every since we moved to the Philly area we have been going every year because he loves it! Last year we were able to even go early because we got tickets for an Audi pre-event which was pretty cool! !